We’ll even give you a FREE credit for your first investment. Earn dividends and rental income! Premier commercial real estate has historically outperformed the stock market. Hitch up the RV & let’s go glamping! Own some of the best resorts in the world… let all that travel pay off! Own the house where all that data lives. Online orders go through here. Student Housing finally pays you! Own the housing where students pay their rent. America is aging. Profit from it! Did you know there are 10,000 baby boomers reaching retirement age every day? Make a call. Get paid. Every time you pick up your smartphone to text a friend data is flying around at a breakneck pace. You know we are an increasingly mobile society. We move around a lot. We tend to keep a lot of stuff and accumulate things. How about delivering some rental income your way? How much does RealyInvest cost? We will be offering a RealyGold program for aggressive investors shortly as well. NOTE: You may pre-pay fees for any level of participation for an 11-month period and receive the 12th month free. 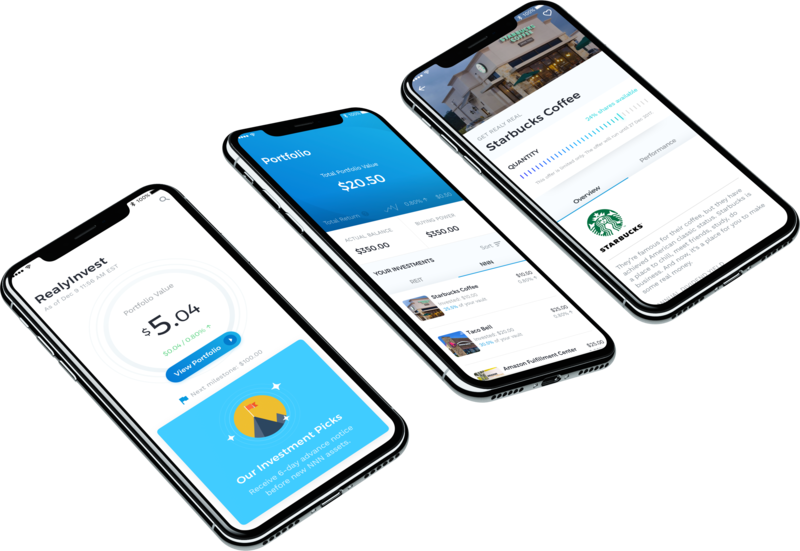 Once your portfolio reaches $5,000 in value, GetReal, GetRealyReal, RealyAutomatic and RealyRetire fees are converted to an annual fee of .25% of total portfolio value, assessed monthly. How much (or how little) can I invest? You can open an account and begin buying REIT shares for $5. You can begin investing in NNN Assets for $20. Should I invest in stocks or bonds as well as premier commercial real estate? Diversified portfolios offer greater stability and work toward building wealth over the long term. Stocks, bonds and premier commercial real estate all have a place in a healthy, diversified investment portfolio, depending upon your investing goals. Sign up for our waitlist and get a FREE $5 credit! While you wait, please pre-register for an account and receive a free credit towards your first investment!